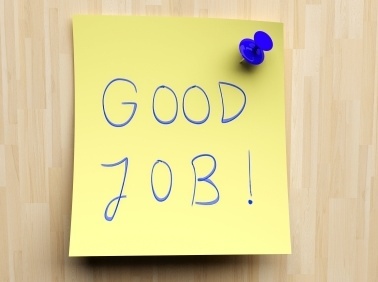 So … how do you know that you’ve done a good job? In Part 1 I posed this question and encouraged you to answer it as fully as possible, and in relation to a particular work-based target. If you’ve not read Part 1, or answered the question yet, I suggest you take a moment to do so now – before you read on! Or perhaps your answers were a bit of both! There is no right or wrong here. Your preferred motivation style just is what it is. Take a look at the language you used to answer the question. Did you use more ‘I’ or ‘me’ language, or did you refer to others / external sources of feedback? If you’re internally motivated – you don’t need external praise and will tend to make your own decisions about the quality of your work, rather than asking other people what they think. Your motivation is self-generated, and you rely on your own judgment when deciding what to do. You also have a tendency to resist others telling you what to do. As you don’t generally need praise from others – you tend not to give feedback, which can be difficult if you’re a team leader or manager, and your team are more externally motivated (see below). You rely on recognition / feedback from others and rewards. You’re more motivated when someone else makes the decision (e.g. on how to move forward with a team project). You generally make reference to external sources (other people / information from elsewhere) to make the judgment on how well you’re doing. If you don’t get sufficient feedback you won’t know how well you’re doing, and this will have a negative impact on your motivation levels. Feedback from others can also come from non-verbal / body language sources. These results will help you to identify your own preferred style (for internal/external). The next step is to use the information from both of these posts to identify your team members’ styles. 1. Pay attention to how they respond to feedback and / or how often they come to you / others seeking approval for their actions. 2. If unsure, or you can’t find sufficient evidence, ask them the question I posed in Part 1, or ask who they involve when making a decision. If they mainly refer to others, they will be more externally motivated. If they mainly talk about being able to make the decision on their own, they are more likely to be internally motivated. About 40% of people are largely internally or externally motivated; and 20% are equally both. However, in a particular job sector, you may get a higher percentage of one type, due to the nature of the job. So how did you fair … and what steps are you going to take regarding motivating your team? In my experience, leaders tend to be more internally motivated. They need to have that internal driver and a strong sense of knowing what they want and how to get there. This entry was posted on February 3, 2012 at 16:33 and is filed under Business, Education, Goals and targets, Leadership. You can follow any responses to this entry through the RSS 2.0 feed. You can skip to the end and leave a response. Pinging is currently not allowed.